We still imagine ourselves a nation of laws, not men. That is not merely an article of faith but a bedrock principle of the United States Constitution. In drafting our founding compact, the Framers confronted a wrenching paradox. For the fledgling nation to be survive – for it to have the security the Articles of Confederation failed to provide – awesome powers had to be concentrated in a chief executive, the president, empowered to act swiftly and decisively in times of peril. Yet, there was no greater threat to liberty – the defining American imperative, the very reason for creating a central government – than the concentration of unchecked power in a single government official. Consequently, the debates at the Philadelphia convention centered not on whether presidential power had to be effectively checked – a premise on which there was unanimity – but on how to do it: how to stop a rogue executive who abused his awesome powers, who imperiled liberty by becoming a law unto himself. The Framers thus vested Congress with two checks on executive excess: the power of the purse and the power of impeachment. They are potent remedies, but they are also the only remedies. There are no others. 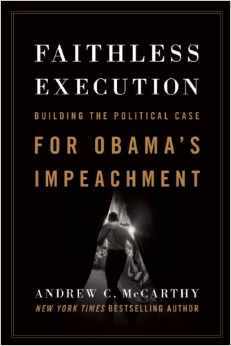 As Faithless Execution will demonstrate, it is a straightforward matter to plead articles of impeachment derived from these episodes – to establish “high crimes and misdemeanors,” a term of art borrowed from English law, signifying maladministration and abuses of power by holders of high public trust. To focus on the individual episodes, though, is to miss the overarching offense: the president’s willful violation of his solemn, constitutional oath to faithfully execute the laws. The modus operandi for the transformation he promised is to concentrate power into his own hands by flouting law – the Constitution, statutes and judicial rulings – and essentially daring the coordinate branches of government to stop him.